Just over a week ago I returned from Washington State, after a four day excursion that saw me climb around orchards; tour an apple packing plant; get a preserving lesson from a pro - in Whole Foods no less (my first time there! ); dine out in some of Washington's finest organic restaurants; hang out with some of this country's finest (and funnest!) food writers; and wander around Pike Place Market in awe and fascination, wishing I could take it all home with me. And in a way I have. I'm still tasting that organic Gala, picked off the tree, so sweet and crisp. 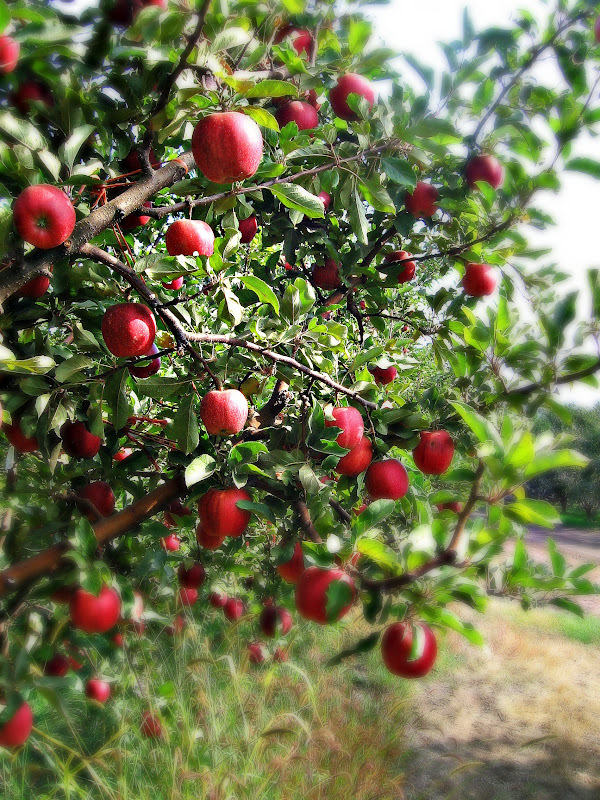 I can still smell the sweet apple pie preserves, bubbling away on the stove. I'm still wishing I could find flowers here, like I saw there, with baby cabbages in them and everything. And the coffee. My God the coffee. So delicious. I have so much to tell you, but be warned! The post is HEAVY on photos and text. Like, I hope you don't get bored. Please come along for the ride - it was a good one. So it felt like I was up in the air all day. My plane left early, like still dark early, and then I flew and waited and flew and waited and finally touched down in the small airport in Wenatchee, some 10 hours later. Even through the smoky veil I could see I was in beautiful country. There were forest fires, contained, but still burning in the area, hence a layer of smoke hovering over the city and surrounding hills. The other five food writers and I were met and whisked away to our hotel where we later met up for delicious nibbles and libations. It was so nice to be on the other end of a reception like that - I'm usually the one preparing the food for such an event. To kick back and relax and watch as someone else replenished the buffet was awesome. Thank you,Chef Richard. Chatting with the other writers and the organic fruit reps was very cool, and we got to know one another over crostini and cheese ball and grilled vegetables, all of it tremendously good. After a long travel day and a belly full of excellent food and booze I was happy to get back to my room, which incidentally was almost as big as my house here in Saskatoon. Wenatchee countryside, looking down from Stemilt Hill. The next morning we had a working breakfast, learning about the organic apples, pears and cherries grown in Washington State, from the The Organic Trade Association, Pear Bureau Northwest/ USA Pears, Washington Apple Commsision and Washington State Fruit Commission/NW Cherry Growers. 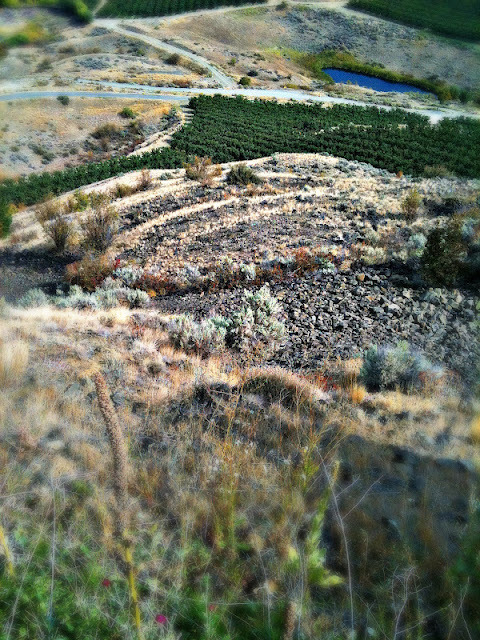 Did you know that Wenatchee is in a micro climate - it's practically a rain forest AND a desert. The severe winter temperatures keep the bugs down and therefore they don't have to use chemicals to kill the bugs in the orchards (they die off from the cold). 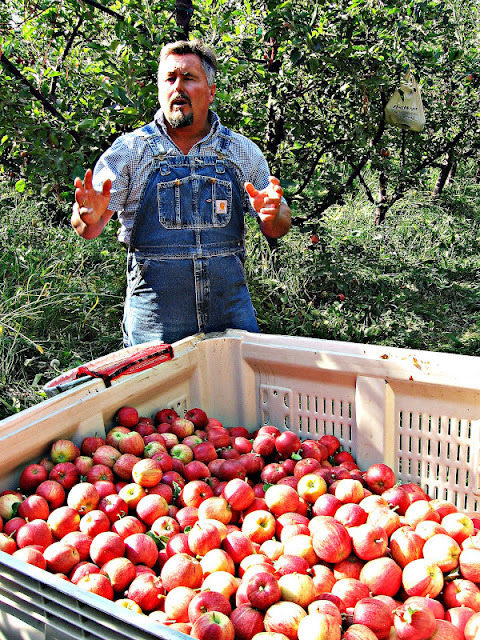 Plus the Wenatchee area is blessed with nutrient rich, volcanic soil, perfect for growing fruit. 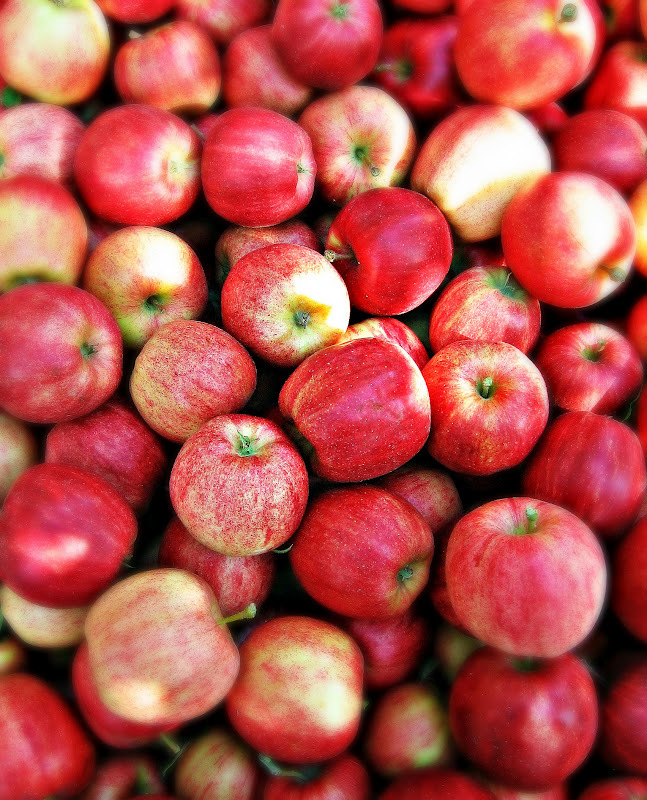 Hundreds of thousands of boxes of this delicious fruit are shipped around the world, but predominantly Canada. 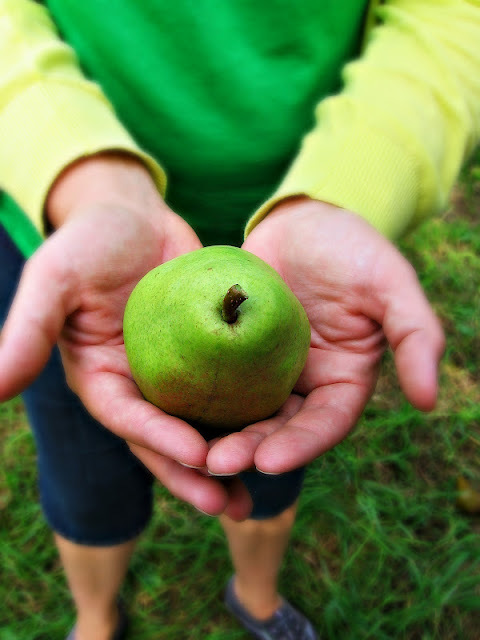 I tend to buy organic apples, unless I can get my hands on some tasty local varieties for a few weeks in fall. Most of the organic apples shipped my way come from Washington State and next time I bite into an organic Gala or Honeycrisp, I'll have a hunch as to its origin, and that makes me happy. Later that morning, the smoke had cleared up quite a bit and we rambled along country roads, winding our way up the hills of organic fruit country, right into Stemilt Growers. Kyle Mathison, the patriarch of the family-owned business, met us in overalls, ready to show off his pride and joy. With a kind, down to earth manner, I was at once aware of his passion for growing; for producing world class fruit. Apples and pears were hanging heavily, and growing beautifully. For miles and miles, this is what you could see. We wandered through the apples and pears, learning about how compost is key to good growing (Stemilt produces their own - I saw it!). That and the luck of growing fruit in a perfect climate have made them the largest packers of apples and pears in the US. It's a cool place, and Kyle is a cool dude. The view through an SUV window. Kyle Mathison and his organic Galas. 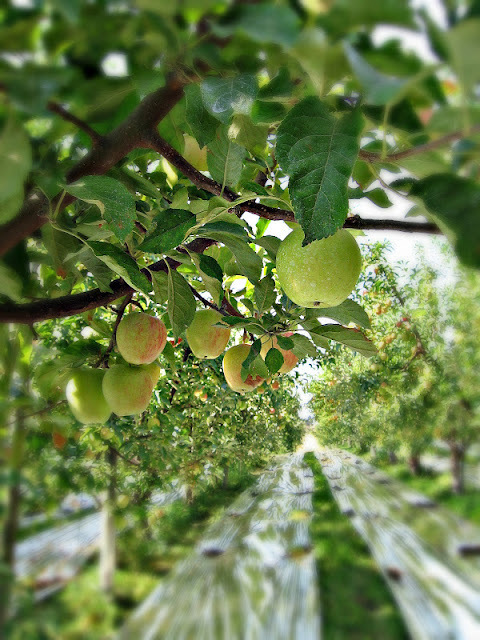 Light reflecting tarp underneath the apples trees, helps speed up the ripening of the apples on the lower half of the tree, so that all of the apples can be picked at the same time. Cool! 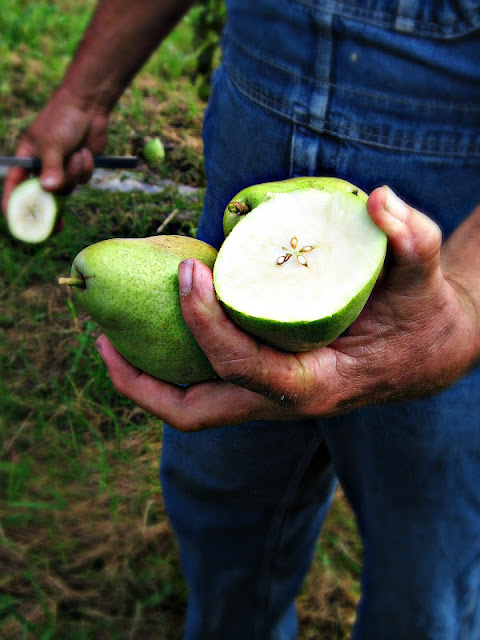 The interior of an Anjou pear. Amy, of Family Feedbag fame, holds an Anjou for me. 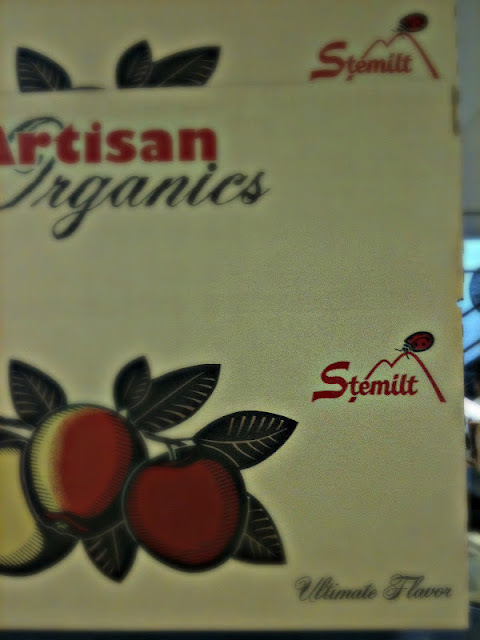 Later, after lunch, we toured the Stemilt packing plant. 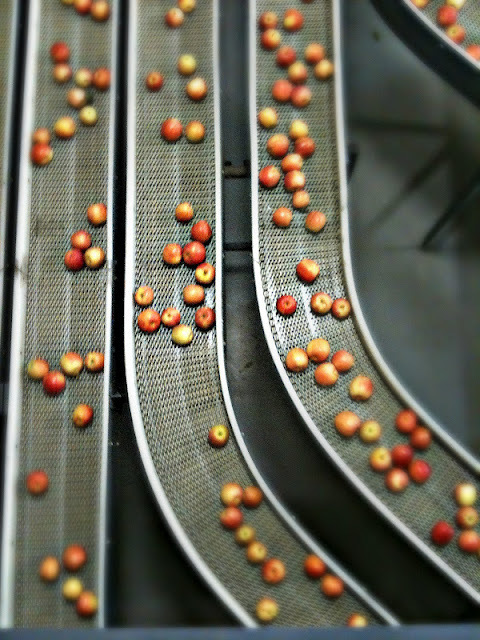 It was quick, but we witnessed the process of apples being washed and sorted and graded and sorted and wow it was busy and noisy. Apparently from the washing to the boxing up, it takes only 10 minutes. I know, right! Then we were whisked away to the airport and a short flight took us to Seattle. Dinner that night was at Tilth - a certified organic restaurant in a quaint Seattle neighbourhood. A four-course tasting menu was enjoyed, with wines to match each. I started off with the fresh greens salad, with house-made ricotta, and while I loved my salad, everyone who had ordered the chilled tomato soup was coooing in pleasure. I was just a little jealous, but hey, I like my greens! Second course I enjoyed risotto, quite lovely, with dandelion greens and pine nuts. Yum. My entreé was grilled hangar steak, with fried green tomatoes, cheesy grits and chow chow. It was perfect. I'd never had grits before, but now I'm in love. Dessert was of course chocolate, in cake form. To die for. Really. Belly full, I returned to my swank room and called my handsome man, telling him of my adventures in wonderland. The next morning we drove to Whole Foods for our preserving lesson with a master - Brook Hurst Stevens, of Learn to Preserve. And she is a master, recently becoming a certified Master Food Preserver, which I didn't even know existed until I met Brook. And she's awesome. In the Whole Foods kitchen she had us chopping apples for Apple Pie Preserves and pears and other goodies for Pear Chutney. While we stirred and snapped photos, Brook offered up helpful hints, like how it's cool for 25% of your fruit for jams and chutneys to be unripe. This enhances flavour and fruit can hold its shape a bit better when it's unripe and being cooked down. Also, if you let your chopped fruit sit at room temp for a good long while, even over night, your preserves will taste like magic. I mentioned that I don't do a lot of canning because I have no where to hide the huge canner when I'm done with it - and Brook suggested to get a similar sized cooling rack to fit in my largest soup pot, and that will make an easier process of it, rather than immersing a tea towel in the pot, like I usually do. Canning! We did it! I haven't cracked open my apple pie preserves or chutney yet - I'm saving those for the coldest day of winter. But I know when I do, I'll be thinking of that kitchen in Seattle, with the master preserver and the smells of cinnamon and vinegar hanging in the air. Apples, in a copper pot I covet. Apple Pie Preserves. Click here for the recipe. 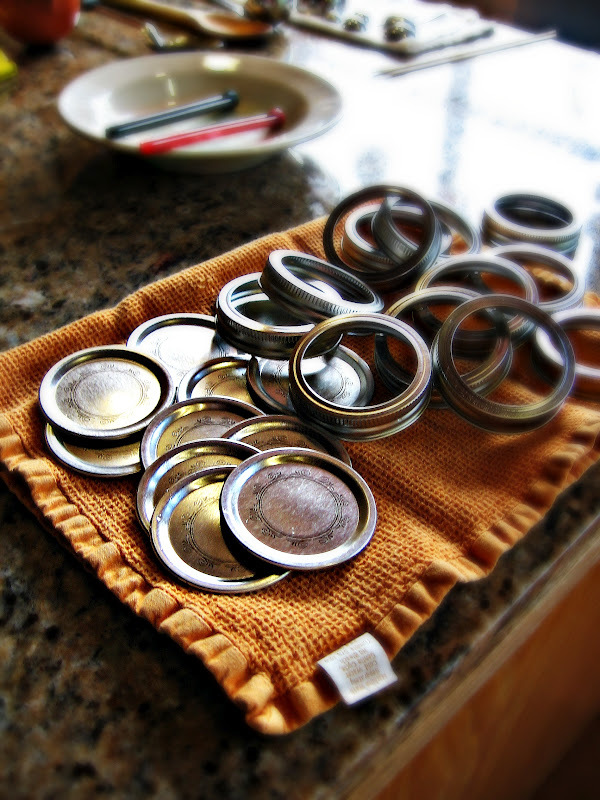 Love sterilized rings and lids. 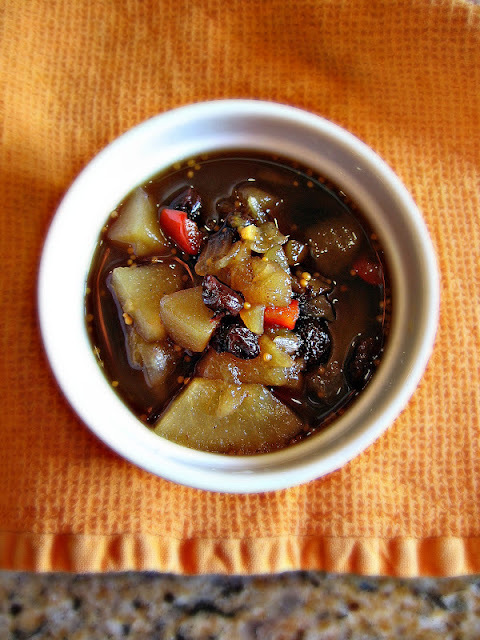 A sampling of Pear Chutney. Our final afternoon left us with free time. 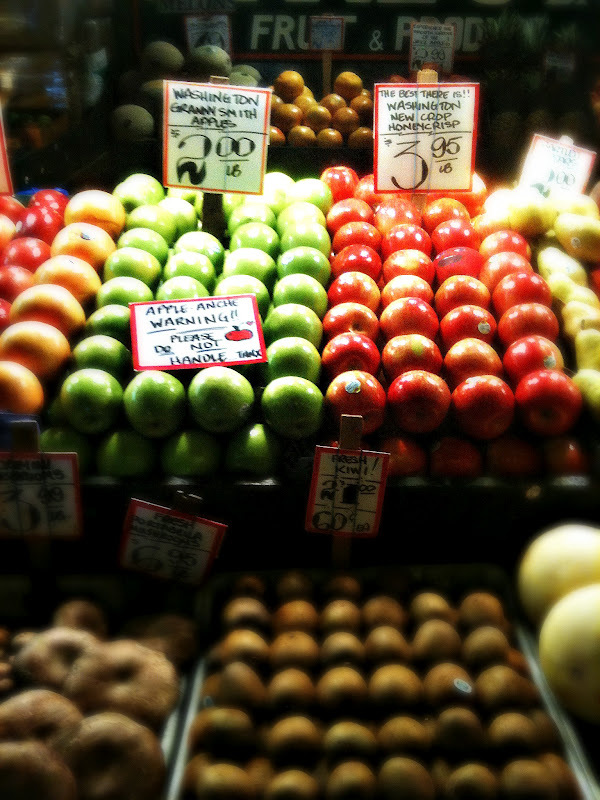 And to me, and the others, this meant the Pike Place Market - a farmers market like I've never seen before. Oh the freshest fruit and veg! Artichokes and asparagus and everything in between. From a chef's perspective, this was nirvana. I would stop at each stall and take a bite of whatever was being offered - mostly apples and peaches. I'd say more than once to my companion - you just don't see this in Saskatoon! I wanted to take some it with me, but alas, not allowed. Even the brussel sprouts were tempting! But it's not all about fruit and veg there - I wandered into the spice place and bought little packages of cardamom pods and smoked paprika and candied ginger and berbere. I saw the freshest fish - eyes so bright and scales so shiny. Some of them even flew through the air! Donuts at the bakery were as big as my head and while they were tempting, choosing the apple fritter was by no means a mistake. Outside, we grabbed a latte at the original Starbucks and then into the cheese shop. I picked out a good looking hunk of old cheddar, which may or may not have been a stowaway in my suitcase. Pike Place is a food-lovers dream. If I lived in Seattle, or even the west coast of Canada, I'd be there all the time. If only to pick up a bouquet with baby cabbages in it. Someone doesn't care for brussel sprouts. The Pike Place pig. I gave him a little pat on the head. Where to go when you are in Seattle. Our final night of eating was spent at Tavolata - serving up some of the best Italian I've had in years. Platters of food kept arriving, and wine was flowing and my rigatoni with sausage was killer. No room for dessert that night, which is really saying something for me. Over the light of candles and the din of restaurant clatter and chatter, I looked around, amazed at where I was, doing what I was doing, and so happy to be there at that moment. How much fun we had - Amy, Jennifer, Paula, Cynthia, Ayngelina! It was lovely to meet you and I hope our paths cross again sometime soon. He played a mean clarinet. On my final morning in Seattle, I made the requisite Canadian trek to Target,snapping up deals as I'm prone to do, then a final stop for coffee and a small purchase of beans to bring home. The handsome man has already brewed some up for me and its glorious. It's memories. It's the wonderment I felt for those four days. The flowers for sale at Pike Place were incredibly gorgeous and inexpensive - this would have gone for $5.00!!! From now on I want all of my bouquets to contain a brassica. Special thanks to Amy and Kate, for your hospitality and professionalism. Your email containing the invitation to visit Washington was one of the best surprises I've had. Thank you! Very special thanks to the Organic Trade Commission; Pear Bureau Northwest/USA Pears; Washington State Apple Commission; and Washington State Fruit Commission/ NW Cherry Growers for inviting me on such a wonderful tour. While this trip was sponsored by the above, I was under no obligation to write a post. I wrote this post because I had an absolutely awesome time in Washington and there is just so much good stuff happening there, I had to share it with you. Looks like a wonderful trip! I love Seattle, it's always a delight. 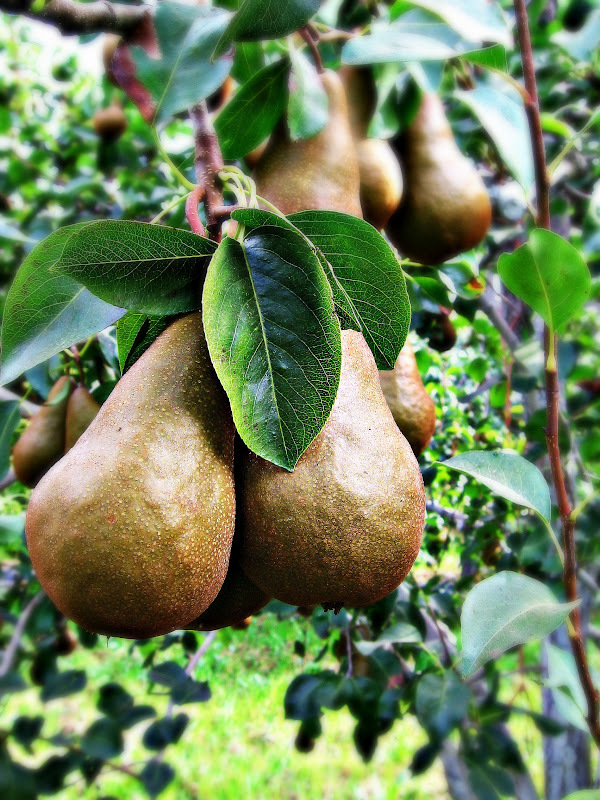 just headed off to work at our (somewhat chilly) market - i surely do hope our fruit supplier can be there today - i love the golden galas as much as i do the red ones (maybe even more) and i want to get some pears to make pear mincemeat for winter...thanks for sharing your marvelous trip! i am deeply envious! You had the opportunity to visit some of my favourite places here. Last Spring I drove down to Wenatchee to tour some of the cideries and tour up to the quaint mountain villages. Of course Pike Place Market is my mecca. Love the chowder, the history, the ambiance and of course the food. Great post Renee, your trip looks and sounds amazing!!! Thanks everyone - I had a really really great time and can't wait to go back! Molly, I hope the fruit people are there a while longer too; no pears today though :( Bellini, sounds like you had an adventure there too. Touring the cideries sounds like good times :) Amy, thank you! Hope to see you again soon! Thanks a bunch Stacy and Stacy - I'm so happy I'm able to share my awesome adventure with you! Renee, what a fun, and delicious, adventure! Your photos are beautiful as always, and seeing all that happy fruit cultivated by thoughtful folks makes me smile. PS I've been meaning to tell you that I'm so digging your cool processing - the dreamy photo effect is really cool! Sounds like you had a wonderful trip! So glad you got to stop at a Whole Foods. My hubs is the Exec Chef of Prepared Foods at the flagship WF here in Austin. It's an amazing company and he loves his job. Is the PNW awesome? Our last two vacations were to Seattle and Portland. We can't get enough of it- quite a change from central texas!